Why I started wearing a Fitbit when I am probably not very fit at all? I wear a blue Fitbit almost every day and have done so for the last 8 months. My Dad asked me if I actually liked it when he saw me checking it over and again and commenting on how little or much I had walked. Don’t let it rule your life he said. I really love it! Let me back track a little. Regular readers to my blog will know that I came to fitness very, very late in life. Like so late that I bought my first pair of trainers when I was on the very wrong side of forty. I really do regret not discovering the joy of walking earlier in life, but I try to make up for it now. One thing you must know before we get into all the statistics etc. is that I don’t walk very fast at all. I also limp and sometimes walk like a ‘constipated tortoise’. I have fibromyalgia and arthritis and it can all be a little painful. Despite this however I strongly believe that the more I walk the better I feel. Walking clears my mind and when it takes place it nature it fills my soul. It also eases out all the creaks and actually makes me feel better. In addition there are also all the health benefits that everyone talks about like weight loss and better muscle tone. Last December I was visiting family in Dubai. My big treat is a visit to an Arabic restaurant so off we went and ordered all these yummy little dishes for sharing. I noticed my brother-in-law was wearing a bracelet. I am very outspoken so I asked him why he was wearing a bracelet. ‘It is a Fitbit.’ I really didn’t have a clue and as I didn’t move in fitness circles despite my love of walking I hadn’t even heard of the concept. He patiently explained it all and told me how it worked. He is really fit and walks, runs and plays squash. I thought nothing of it until the next day when I was presented with a little bag and opened it to find my very own Fitbit. I was honestly quite speechless – what a generous gift had been given to me to encourage my own fitness journey. I strapped it on and was ready to go. 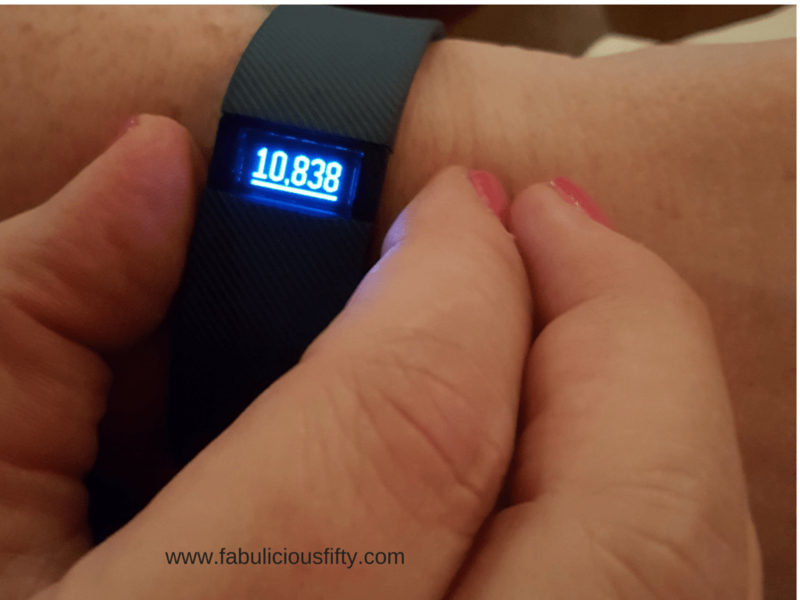 There are a number of things I learnt from wearing a Fitbit and because of these I would encourage everyone who can to try it – or any other fitness monitor. That it is possible to do under a thousand steps a day if you are in an office and don’t move around much. It takes around 2500 steps to walk from my house to the doctor – so there and back is a great way to ensure I get my steps in. I feel grumpy and disgruntled when I don’t walk. Looking at a Fitbit which shows under 2000 steps is a great motivator to get my trainers on and get moving. That it is possible to walk over 10 000 steps before breakfast when I participated in the 5km Darkness into Light walk recently. I also exceeeded myself at the Heart of Galway walk where I logged up 14 000 steps. That my sweet place is around 6000 steps – after this I suffer quite a bit with pain. I am now trying to push my speed a little instead of going further. I have learnt to use the Fitbit to pace myself and prevent myself from getting overtired. For example if I am going into town and know I am going to be pounding the pavements I might drive or get a lift to the station. I have no problem walking the 2000 steps to get there, but the prospect of walking 2000 steps home when I am literally crying with pain and exhaustion isn’t a good idea. A new introduction to the Fitbit app is a little chart which shows how many hours of the day you have been active. This is really cool and a big wake-up call. You get a little red dot for each waking hour you do over 250 steps. It is a really simple but important reminder to get moving. Take a break, stretch your legs and move away from the computer. Although it is always good to log between six and 10 000 steps a day it is better to be active throughout the day rather than doing the majority of steps in one big burst. My Fitbit does all sorts of other things too. It measures my sleep. It is really interesting to see if you are in fact getting a good night. The app – on your phone where you can view all the data from the device shows periods of restfulness and periods of being awake. When I first started wearing it I was rarely getting a decent 8 hours. Now I often get those restful hours so necessary to keep smiling. I also love the little virtual rewards – badges that you get for reaching milestones. It is always nice to get a pat on the back! I hope I can motivate other people like me (who might be overweight, unfit and battling with pain) to get moving. Thank you for reading – I am off to get my Fitbit off the charger and go for a walk. « Do you need a digital declutter?